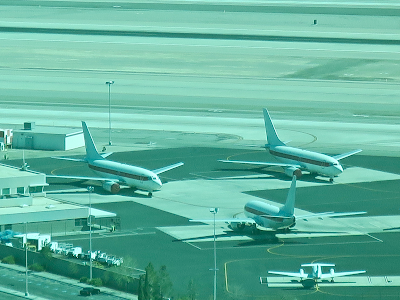 My room at Four Seasons Las Vegas was a great place to paparazzi some unique birds parked at McCarran International. These mysterious 737-600s are a part of so-called "Janet", a highly classified fleet of passenger jets operated for the United States Air Force. They say these planes are used for transporting military personnel to the remote facility commonly known as Area 51. Another famous birds. These two 747SPs are privately operated by Las Vegas Sands, a casino and resort company who owns properties such as Marina Bay Sands and the Venetian Macau. One of them made its first flight with Pan Am and the other was a formerly a TWA bird. I got closer to one of these SPs on the ground. 3 days in Vegas. I wanted to stay at a less bling-bling hotel, so I chose Four Seasons at the south end of the Las Vegas Strip. 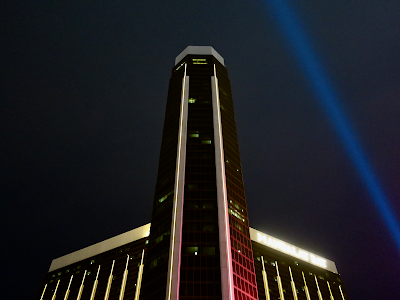 This hotel occupies 5 floors between the 35th and 39th floors in the tower of Mandalay Bay—a typical casino hotel owned by MGM Resorts—but thanks to a dedicated driveway and entrance, you won't be caught up in the hustle and bustle of the casino. 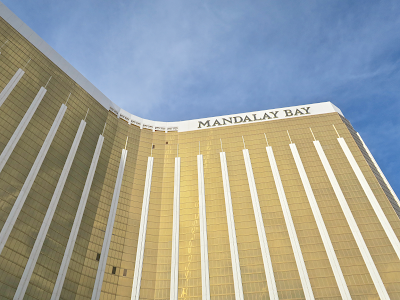 When I entered the Mandalay Bay part of the building, I saw a super long queue for check-in and some guests sitting on the floor, therefore their lobby felt like a LCC terminal. On the other hand, the Four Seasons part was calm and peaceful. 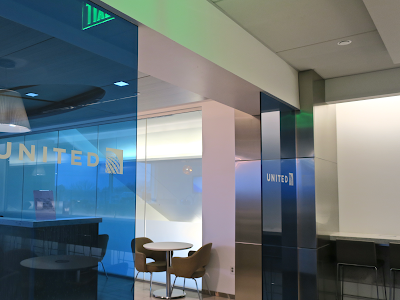 This time at Sea-Tac, I visited United Club, not Sky Club, and was delighted to see they were showing respect for their rich history. Delta should do the same. A lovely photo. DC-6 Mainliner 300, which cruised at 300mph, over San Francisco. Had breakfast at Denny's in somewhere south of Tacoma. Then drove to the foot of Mount Rainier enjoying HUD on my Escalade. Checked into W in downtown Seattle. The front desk staff told me that they upgraded me to a suite, but the room was just a corner room which comes with a long corridor. But the room has this: A nice Rem Koolhaas view. 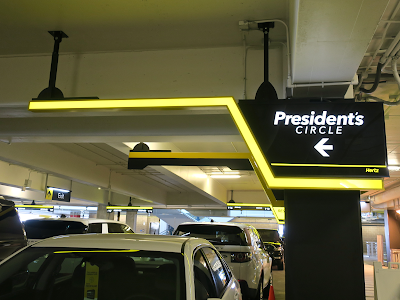 Thanks to Delta, I have become a President's Circle member of Hertz. That means now I can rent any car parked in designated lots without paying additional costs at almost every location. It is a boy's dream come true. 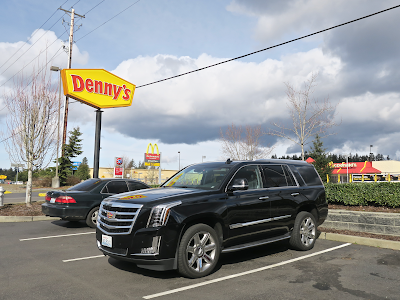 This time at Sea-Tac I found a massive Cadillac Escalade in President's Circle area, so I took it. It's a bit too hip-hop for driving around Seattle, but I'm sure this car will make a long ride comfortable. Thanks, Hertz (and of course, Delta). Slightly different from my usual bed. Dawn. Wing flex. And a Rolls-Royce Trent 1000. A lavatory with a view. Good morning, Seattle downtown and the Space Needle. Flying over Boeing Field, one of the birth places of the Boeing 787. A new Boeing 737 MAX 8 is sitting on the tarmac under us. Today I'm flying to Sea-Tac on a non-Delta airline for some reason. 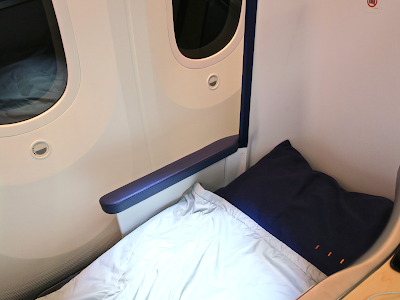 It's not ideal for my mileage accumulation, but the good thing is I can take a ride on the 787-9 for the first time. It's been a long while since my last ANA international flight. I love the moving flight map with a HUD-esque interface and analogish flight instruments. When it comes to Japanese meals, no other airline can do better than Japanese airlines. Today's dinner was prepared by Tofuya Ukai in Shiba, Tokyo. ANA B787-9 NRT-SEA. The 677th flight in my lifetime. 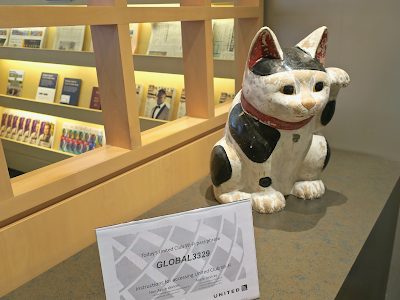 I was welcomed by a welcoming cat (Japanese traditional lucky cat) and entered United Club at Narita T1 South Wing. 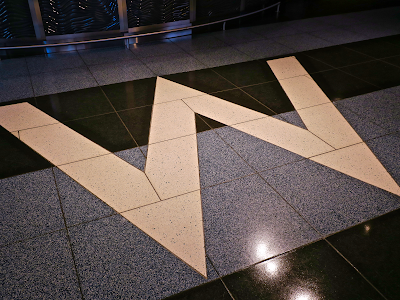 I'm a Delta flyer, therefore a North Wing guy, so not familiar with this wing and lounge. Feel like I just stepped into hostile territory. However, this lounge offers great tarmac views thanks to its location right next to the the ramp. 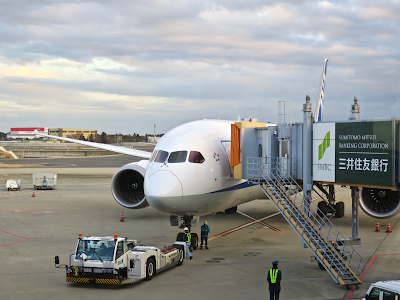 A Dreamliner from the friendly skies arrives against a dramatic Chiba sky. UA will retire the Queen very soon. Glad I could see one of them today.